Our pets are an important part of our lives. And oh, what a relationship that is! We love our pets tremendously. We want give them everything they need to have a happy, loving and safe life with us. They brings us so much joy. But then they leave us and we have one more duty to our friends. A gift that helps us remember them. When that time comes, know that we can help. Our promise to you is to offer affordable and high quality pet urns and to have them delivered on safely and on time. If you have any questions always feel free to call or email us. We love to talk to our customers everyday. We have plenty of information on our website that can help you choose a dog or cat urn. The most imporant decision is to determine what size urn you need. Please click the link or call us if you need any help. 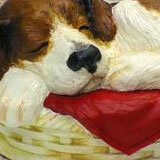 Pet urns come in many different materials. Choose from Wood, Metal, Brass, Ceramic, and Cold Cast Sculpted Resin Urns. Many of our pet urns can be personalized with an engraved photo of your dog or cat or just their name and dates and a short sentiment. We offer free shipping on all of our urns.